The deal was unfolding perfectly: LOI looked good, negotiation went well, and due diligence revealed a financially robust company guaranteed to be an asset. Then, after day one, everything started to fall apart. This is a painfully familiar story to anyone working in corporate development, integration, or the upper management of companies with an aggressive inorganic growth strategy. It’s no secret: the majority of deals fall apart because of poor integration practices. Even in cases where integration is successful, poor implementation can still destroy value for both companies. So how do you make sure your team successfully bridges the gap between diligence and integration? Industry insiders agree across the board that a smooth hand-off between the corporate development and integration teams is imperative to capturing value in a deal. Time and time again at FirmRoom we hear about companies with no dedicated integration teams, completely disconnected corporate development and integration practices, and a deal process carried out by poorly communicating functional groups in information silos—often while still performing their regular daily tasks. Reorganizing and optimizing this process can help your company capture more value from its acquisitions and avoid disastrous deal failures. Different companies take varying approaches to this transition. The most effective practice is to have a dedicated integration team working closely with corporate development from the earliest stages of the deal. This approach doesn’t just bridge the gap, it eliminates it almost entirely. However, this strategy is only realistic for large firms with enough capital to maintain full time integration staff—and enough acquisitions to keep them busy. A good approach for smaller companies—or those who only acquire irregularly—is to tag key members of the integration team to sit in on due diligence. This will help minimize unpleasant surprises for integration, and it will also help eliminate duplicate work. Due diligence uncovers a great deal of information that will be used again during the integration process. If the deal is simply thrown over the wall by corporate development, the integration team has to start from the beginning—and they will end up repeating work already done by corporate development during due diligence. Incorporating integration members into the due diligence process helps ensure a smooth transition with minimum repeat work. However, this approach can easily lead to fatigue among members of the integration team, since they must maintain an increased workload over a longer period. By the time these team members make it to the integration stage, they may have already been working the deal for months. A third approach taken by some companies is to have a dedicated project manager who follows the deal from initial approach through the close of integration. With this approach the project manager has a bird’s eye view of the entire process, allowing them to synergize workflows and identify bottlenecks which would be invisible to ground-level teams working in silos. Poor information sharing and cross-visibility between different functional groups is one of the biggest challenges many companies face during the acquisition process. Companies typically address this problem by holding weekly meetings in which the various functional groups give an account of their progress, identify problems they have encountered, and share relevant information with their colleagues in other workstreams. However, this process has many shortcomings and potential pitfalls. Most critically, attention quickly flags in meetings according to their length, the complexity of the information communicated, and the number of people participating. In a conference call with twenty participants, listeners begin to check out almost immediately—reading emails or performing other work—and might miss critical information. A weekly meeting also encourages functional groups to put off reaching out to other departments with questions or comments. Instead, they simply wait for the next meeting, creating a critical drag on cross functional collaboration. 3. Keep Your Integration Schedule Tight. 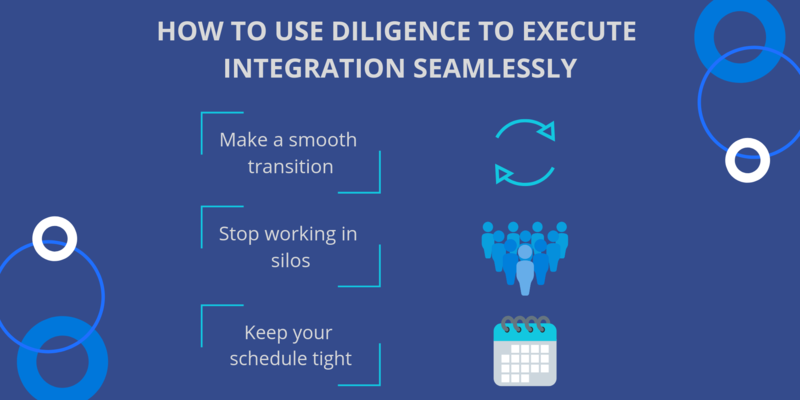 Ensuring integration happens according to a clearly defined schedule is critical. It is doubly important if your company is too small to field a dedicated integration team. The momentum initially experienced after an acquisition can help propel a team rapidly through a well-mapped integration strategy. Around the 100-120 day mark, however, that momentum fades rapidly, and problems with fatigue and team morale set in. If your team can’t close out integration by 120 days, the time it takes to fully integrate your new acquisition could extend exponentially. A single block or bottleneck can jeopardize the momentum of your integration, a series of them can destroy it entirely. In the end, every deal is unique, and it is impossible for a software to fully anticipate the needs of any individual integration. However, by using cutting-edge FinTech, companies can eliminate low-value and repeat work, encourage cross functional collaboration, and keep employees focused on high-value activities that really move the needle.